“OUR AIM is to break through the indifference, above all that of the international community, and to strive to ensure that after February 24th no one can continue to ignore the persecution of Christians.” Thus spoke Alessandro Monteduro, the director of our Italian office. Martyrdom is not a thing of the past. At a press conference in Rome, Feb. 7, 2018, Mr. Monteduro announced that Rome’s famous Colosseum—an ancient symbol of Christian martyrdom—will be lit up in red at 6PM Rome time; right at the same time, the Maronite cathedral of Saint Elias in Aleppo, Syria and the Church of Saint Paul in Mosul, Iraq will follow suit. Last year some major monuments and Church buildings were lit up in red: the Trevi Fountain in Rome, the Palace of Westminster in London, the statue of Christ the Redeemer in Rio de Janeiro, the Basilica of the Sacred Heart in Paris, and Manila Cathedral; the red light symbolizes the blood still shed today by so many Christians around the world. 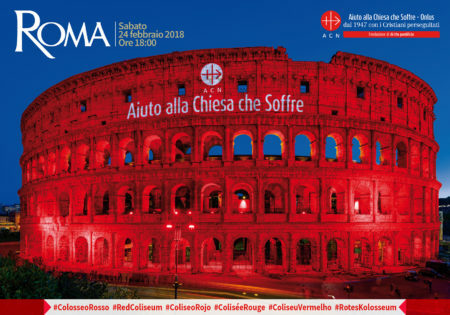 The evening of February 24th at the Colosseum will see the participation of a host of dignitaries, including: Cardinal Mauro Piacenza, the international president of our organization; the secretary general of the Italian episcopal conference, Bishop Nunzio Galantino; and the president of the European Parliament, Antonio Tajani. The event will also feature extraordinary testimonies of persecution. Speaking will be Ashiq Masih and Eisham Ashiq, respectively the husband and one of the daughters of Asia Bibi, the Pakistani Catholic woman who was sentenced to death in 2009 on a trumped-up charge of blasphemy, and who still remains in prison today. Their testimony will be followed by the dramatic personal account of Rebecca Bitrus, the Nigerian woman who was captured and held hostage for two years by the Islamist terror group Boko Haram. She finally managed to escape, still bearing the child of one of her abductors.